On arriving at 32 Red Bingo, there is an overall feel of fun and excitement.Styled in a bold red colour with a friendly bingo ball mascot this site really has an upmarket feel compared to other online bingo websites and it just screams Vegas Baby at you. Easy-peasy sign-up process. Mind you, I wouldn't expect anything less from the sister site to casino of the decade. When you sign up to the 32 Red Bingo website, you will automatically receive a £10 bonus. You will get this bonus just for signing up and do not need to deposit any funds in order to get this money. This is a nice touch and gives new users the opportunity to test out the games and software before depositing any of their own money. 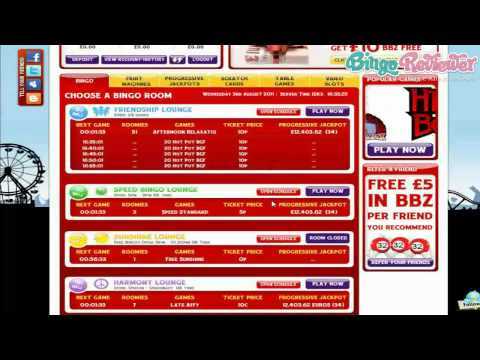 32 Red Bingo is a very user friendly website; possibly one of the easiest websites of its kind when it comes to usability. The site is very simple to navigate and even the least experienced of users should have no problem playing bingo on the 32 Red website. Any information you may require is very easily accessible. Information about any offers is always prominently displayed and games and chat are all very easy to find and use with ease. The 32 Red Bingo site only offers 90 ball bingo which is the most popular form of online bingo; however on the side, these guys have an exceptional selection of slots, bonus games and even video poker! 32 Red Bingo have a really excellent set of promotions which are available on a monthly basis, including £25 loyalty bonus and £5 refer-a-friend scheme. They also offer a range of progressive jackpots which are won on a monthly basis and offer some very reasonable jackpots which are well worth playing for. Tickets for games start from 5p, so the opportunity to really do well on this website is evident. Fans of chat may be slightly disappointed with this website as it is not one of the best chatting communities out there with players seeming to be more focused on the games than starting up a conversation with each other. but, if chats not your thing, you will probably love this site for that. However, the chat hosts are very welcoming and do engage with the members well and are always very helpful and friendly to anyone who needs them and the other players do support each other and wish each other well, it's just that you will not get the same level of gossip here as you would on a lot of the other online bingo sites around. 32 Red Bingo has a really great customer support service available to any users who need assistance. The support team are contactable via an instant chat system similar to an online messenger service. They are available to users at any time of the day and night and are always extremely friendly and will do their best to sort out any of your problems with patience and friendliness. The FAQ pages are also very useful and most of your questions can be answered simply by taking a look at that. Overall, the site is fun, easy to use and friendly. The promotions are excellent and the software is very useable. Then we suggest you try Jackpot city bingo which has recently had a fresh new design, the site has a great promotions team meaning lots of offers for players. Another site that will be well known to landbased players is Beacon bingo, a much simpler site that offer high quality bingo without being complicated. This site is great for people who are just beginning their online bingo journey. So if you want to convince people to try out online bingo, this is just the site to point them to! I think that it is great that they made every effort to come up with a design that entices you to sign up and explore the site more. The sign up bonus shoud tide you over when you are learning the games. That just means that you can easily enjoy the site even before you spend money. This is really one great looking site. I really like what they did with their logo. What is more, the site is pretty easy to navigate and use. All the information you need to know is given to you! I think that this site is good for newcomers to the game. While I do wish that they offer other games aside from 90 ball, having no choice further simplifies the site and makes it great for beginners. I agree, my mom really loved them when she had a question and they were very responsive. They even have an instant chat line for people who need help around the clock! This site has a very nice layout! I love the amusement park look of it. If you’re looking for a spectacular welcome bonus, you’re not going to find it here. However, they do start you off with something. All new players will receive £10 free upon registration. In addition to this, players who deposit at least £10 on their initial deposit will receive an extra bonus of £32. The welcome bonuses were ok but they are certainly not what prompted me to join the site. They have a very standard selection of bingo games available. You can expect to find the classics such as 75 and 90 ball. If you like variety when it comes to gaming, they also have plenty of other games to choose from. Bingo slots are available as well as regular slot games, video poker, table games and very nice jackpots! They have some great promotions aside from the welcome offer as well. Although the layout is very similar to what I have already seen, it manages to somehow look fresh and exciting to new players. It is a Microgaming site that keeps all the things that keep them on the top spot in the industry. There are no downloads here, just a quick registration process and log in, and you're up! I like their new players promotion, first you get a £10 no deposit bonus just for signing up, and when you deposit a £10, you get £32, follower with a 25% reload bonus. There are also nice weekly and monthly bonuses, and if you decide to buy 6 tickets in advance, you get another 6 for free. There are five rooms in total for playing bingo (Friendship Lounge, Sapphire Lounge, Harmony Room, Speed Bingo lounge and Sunshine lounge), with 75 and 90 ball games. I only wish they add some more popular Bingo variants.